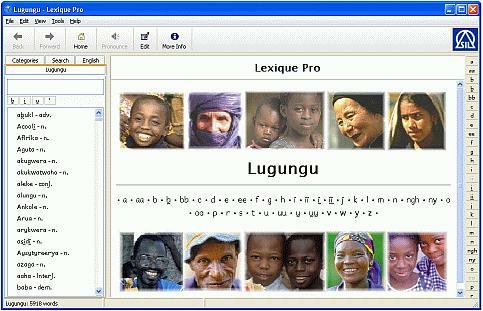 When you click on Download in the menu, you will be able to download a PDF format version of the Lugungu dictionary. This format allows you to read the dictionary on your computer as if you were reading a copy of the print edition. It is an exact duplicate of the print edition, but in electronic form. Once you have downloaded it you can read the dictionary without being connected to the internet. Clicking on Download also gives you access to a windows program that you can install on your computer to display the dictionary in a format that can be browsed and searched. Once it is installed, you can use the dictionary when you have no internet access. 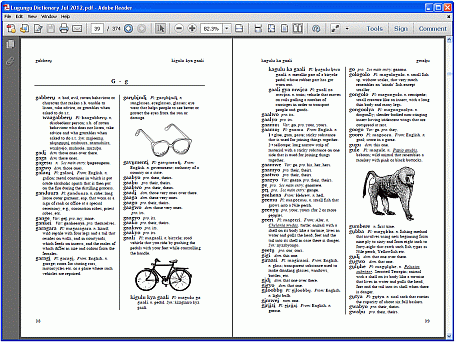 This offline version is similar to browsing the dictionary online, however it has a search function that allows you to search the dictionary for individual English and Lugungu words (unlike the online browse which only allows display of all the words beginning with a single letter at a time).